As Chico Marx famously asked in the 1933 movie "Duck Soup," "Who are you gonna believe, me or your own eyes?" During the men’s giant slalom semifinals on Saturday, Slovenian Zan Kosir appeared to beat Lee Sang-ho of South Korea in a dramatic finish that was too close to call by the naked eye. But officials concluded Lee won by .01 second, and he went on to win South Korea’s first Olympic snowboarding medal — a silver — in the final. The rules of the event state that the winner is the first racer who crosses the finish line "with any part of his body." Replays of the finish appeared to show Kosir’s hand and snowboard crossing the red line ahead of Lee’s, according to NBC’s camera angles. Kosir loudly protested the call, saying "It's not true," as viewers at home took to social media to object to the decision, with some alleging "the Olympics are rigged." NBC Olympic announcers and the Olympic organizers lost all credibility when Lee Sang-Ho clearly lost the race and gave it to him anyway. Zan Kosir won that race and it is a shame his opportunity to go for the gold was stolen from him. Not since Angelia Jolie thrust her right leg out of the thigh-high slit on her Versace dress at the Oscars has an extended limb caused such a stir. However, the decision stood. As Chico Marx famously asked in the 1933 movie "Duck Soup," "Who are you gonna believe, me or your own eyes?" In the men’s 5000m men’s speed skating final, the difference between second and third place was .002 seconds. Canada’s Ted-Jan Bloemen secured the silver medal with a time of 6:11:616. Norway’s Sverre Lunde Peterson finished in 6:11:618 to nab bronze. Simon Schempp, of Germany, left, and Martin Fourcade, of France, right, race across the finish line during the men's 15-kilometer mass start biathlon at the 2018 Winter Olympics in Pyeongchang, South Korea. 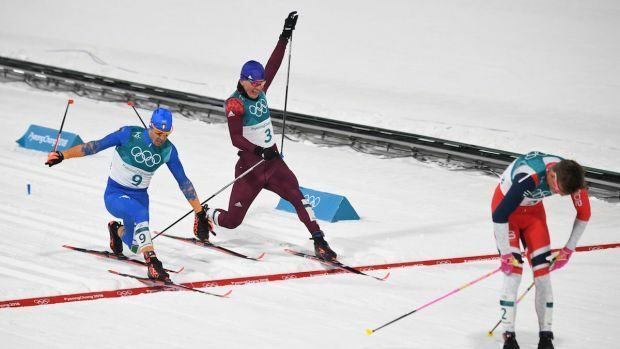 French Olympian Martin Fourcade won the men’s 15km mass start biathlon by centimeters in a photo-finish victory after a furious sprint against Germany’s Simon Schempp. It was sweet redemption for the Frenchman, who earned silver in this same event at the 2014 Games after a photo finish loss to Norway’s Emil Hegle Svendsen. 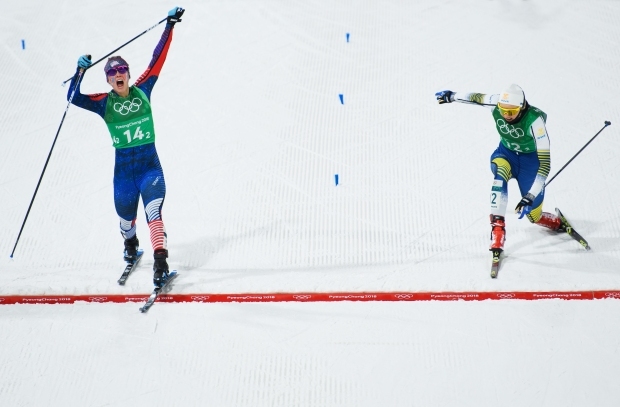 Jessica Diggins of the U.S. stretches across the finish line to win gold ahead of Stina Nilsson of Sweden (12-2) during the women's team sprint free final at the 2018 Winter Olympics in Pyeongchang. The U.S. women ended a 42-year Olympic cross-country medal drought Wednesday with a thrilling finish in the team sprint freestyle event at the Alpensia Cross-Country Centre in PyeongChang, South Korea. In a sensational final stretch, American Jessie Diggins surged past Norway's Marit Bjoergen and then out-sprinted Swedish skier Stina Nilson to win gold by .19 seconds. Norway's Johannes Hoesflot Klaebo crosses the finish line as Italy's Federico Pellegrino (L) snatches silver and Russia's Alexander Bolshunov, bronze, in the men's cross-country individual sprint classic final at the Pyeongchang 2018 Winter Olympic Games on February 13, 2018. While Norway’s Johannes Hoesflot Klaebo led the men’s individual sprint from start to finish and easily claimed gold, the real battle was for second. Italy’s Federico Pellegrino and Alexander Bolshunov, an Olympic Athlete from Russia, raced to a photo finish for silver. Pellegrino edged out Bolshunov by .02 seconds. South Korean Choi Min Jeong suffered a devestating loss to Arianna Fontana of Italy in a dramatic finish in the women’s short track 500m final at the Gangneung Ice Arena. Choi, the hometown favorite who earlier had set an Olympic record in the heats, was edged out by barely half a blade by the decorated Italian, before being disqualified for interference.